Parisiens, famously blind chauvinists, have discovered the rest of the world and found it…delicious. Italian is the newest rage, with proliferating trattorie in every neighborhood and even a gelato shop boldly planted just steps beyond the Ile St. Louis where Berthillon reigns. Back from a six weeks retreat to work on my memoir (even a hermit has to eat dinner), I can report that snails are having a rousing revival and frog's legs are dancing everywhere. Provence has given way to a band of chefs from the Southwest. Restaurants in the grands magasins and boutiques like Kong, crowning the Kenzo boutique and the Cristal Room at Baccarat, are making news. As I left town, Le Marcel, yet another ouevre from the ubiqitous Alain Ducasse, had just opened at the mythic Drugstore Publicis, completely redesigned on the Champs Elysees. And no surprise - Joel Robuchon's resurrection behind the strikingly handsome counter in his shiny black Atelier du Robuchon has inspired a small surge in…counter chic. Sushi counters aren't new, but seated around the conveyer belt at Lo Sushi's counter in the cellar on Rue Pont Neuf, diners flirt via email from scattered terminals. And at Pere Claude in the 15th arrondisement, there are four stools at the zinc-topped counter (they call it the vagabond table), with an excellent view over the chef's shoulder as he sizzles seafood and meats a la plancha on a big iron griddle. Gascony-born Alain Detournier doesn't bow to anyone as inspiration in the two essays he's written explaining his new instantly hot Pinxo, where chefs whirl like Martha Graham dancers on fast-forward - searing, sauteeing, and plating before the eyes of soignée diners seated at the slick black counter. 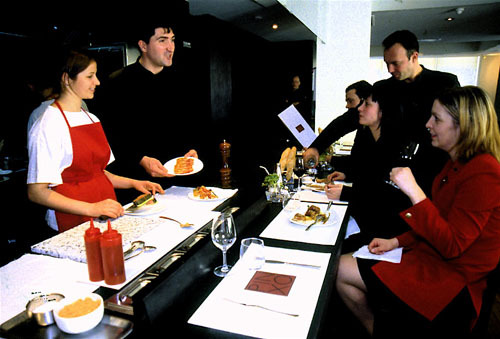 Habitués know to ask for "la table de granite" when they call to reserve. We're four, so it seems friendlier to watch from our small table as we share tuna "seviche" rolled inside eggplant and piquillo peppers, baby squid a la plancha with garlic chips, and Asian-inflected crab in a vegetable roll. Everything comes on small rectangular plates, often strung on rosemary stems, and even the chocolate cake comes skewered (not on rosemary, thank heaven) alongside green tea sorbet. "Les Abat nobles de veau" is the luscious exception. The "royalty" of innards - sweetbreads, liver, and kidney - are wrapped in a crisp leaf of pastry with onion marmalade and citron confit. And most everything is served in threes: Three nubbins of lacquered tuna, three little chunks of contre filet, three cute baby babas…each dish meant to share, perfect if you happen to be a menage à trois. Being four, we must slice one tiny cube into two. Deciding who gets shorted is like a Rorschach test of ability to play well with others. 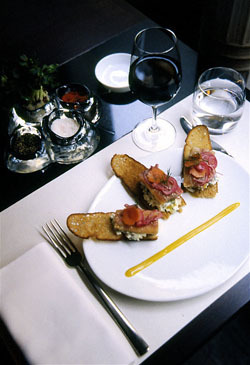 All this stylish stuff has nothing to do with tapas or even the small snacks the Spaniards call pinchos or the Basque pinxtos "we love in the bars of San Sebastian," insists Detournier, dropping in from his grand Michelin two-star Carres des Feuillants around the corner. He wants you and me to believe that PIN stands for "Pleasure for Innovation" and XO is synonymous with the highest quality as in cognac. "To pinch," he says, pinching a crouton with marinated herring, horseradish, and "granny smith," in thumb and forefinger, and taking a bite. And it's not just stylish - Louis Vuitton plastic on the chairs, sange de beouf stucco walls ("smashed raspberry," the chef suggests), it's delicious too, and pleasantly permissive. You can eat as much or as little as fits the mood, as late as midnight, and drink one of six wines by the glass. Amazingly, fusty old Michelin agrees. "I never expected a star," Detournier told me. "I didn't even think of Michelin with paper mats on bare tables," as he told the Michelin inspector who introduced himself one day, asking why the chef had not alerted them to his newest canteen. "You think we are too stodgy to understand this?" the Michelin man said. "Well, now you know we can appreciate what's new." Pinxo. 9 Rue d'Alger, tel Paris 01 40 20 72 00, tel from U.S. 011 33 1 40 20 72 00. Small plates from 10E ($12) to 22E ($26.25). Wines by the bottle start at 25E ($30). Some travelers, Paris habitués, can't wait to hit the Louvre, the Beaubourg, the Musee d'Orsay. Inevitably, my hunger for art brings me to the sense-searing Food Halls of Bon Marché, which (not wanting to challenge my wardrobe) I treat like a museum. Today it's easy to resist the usual cravings as we're riding the escalator to Delicabar above, for its advertised "snack chic." Soon there will be a queue, not just shoppers and tourists, but neighborhood workers on midday break, ladies who lunch, and the relentlessly trendy. Banquettes in lipstick colors of red, fuscia, and orange quickly fill. And weather permitting, a glass wall opens to tables in the garden. But we're early enough to claim two seats at the sinuous curve of see-through glass counter that glows from below in a futuristic mode by Swiss designer Claudio Cokucci. Here we're not spying on the cooks ballet - they're in a kitchen hidden behind racks of spring frocks and t-shirts. Rather, we are gazing through glass at row upon row of tartlettes, sables, milles feuilles and cristals (fruits or vegetables in aromatic gells) - sweet and savory, tempting, irresistible. The whirling dervish in Issay Miyake pleats is Helene Samuel, a restaurant consultant and one-time right hand of Alain Ducasse, who put together this clever concept to show off the talents of her chef-patissier partner, Sébastien Gaudard. He prepped under Pierre Herme at Fauchon. Sweets are listed in red, savories in green, under somewhat idiosyncratic menu categories:"sabayon," "cristal," "fine-feuille," "mille-feuille," "avec du pain." The latter, with toasted pain du levain from the celebrated ovens of the Maison Kayser, includes foie gras and toast in three guises and butter bread with chocolate, milk or dark. A fine vegetable potage has a not-crisp enough strip of bacon on the side in the soup category that also offers chocolate with poached pear. Savory salads come red, white, and green. I loved the white: a toss of champignons of Paris, Chinese cabbage, celery, and lemon-dipped green apple in a yogurt cream. Shimmering bubbles might be carrot in a sesame cream on a sesame sable, or sensational "chocolate intense," unctuously pralineed, just as the menu promises, with fleur de sel, on a cookie flecked with bits of cacao bean. Suspicious of what sounds like mostly chick food, my guy finds comfort in a zesty red salad and fine jambon serrano on tasted country bread. And since Helen Samuel has been a pal since we met over a pot au feu of pork at a favorite little restaurant, l'Avent Gout, I agree to try her foie gras au chocolat, despite a prejudice fueled by chocolate-smothered foie gras at Lutece. What a shock. I'm actully quite taken with the odd coupling, the contrast of textures, the layering of intense dark bittersweet chocolate and the sweet liver, again on that rustic toast. It's possible to have a chic enough snack here for $30 to $40. Wine by the glass is half what it might be in New York, but know that you can count $4.80 for a Coke, up to $8.40 for pot of tea from the ambitious menu of 32 teas and tisanes, and $6.50 for a glass of fresh squeezed orange-and-carrot juice. This is not fast food, either. In February, the kitchen seemed a bit slow. Time enough to watch the good-looking crew in black pajamas dipping and pirouetting behind the counter, pulling out a tartlette of lemon curd or plating a shiny mango bubble with its surprise darjeeling tea-flavored custard. That unctuous pralined chocolate bubble is a must, but try the assortiment of sweet-savory sables (butter cookies), too - cocoa bean, hazelnut with salt, parmesan-rosemary, black olive, and sesame. Slightly sweet, but not too sweet, totally brilliant. A Gaudard chocolate comes with coffee and by the takeway box, too. 26 Rue de Sevres. (7th arrondisement) Tel from U.S. 33-1-42 22 08 60, tel Paris 01 42 22 08 60. Lunch for 2 $50 and up. Open Monday, Tuesday, Wednesday, and Friday from 9:30 to 7 p.m. Thursday from 10 a.m. 'til 9 p.m. Saturday from 9:30 a.m. 'til 8 p.m.